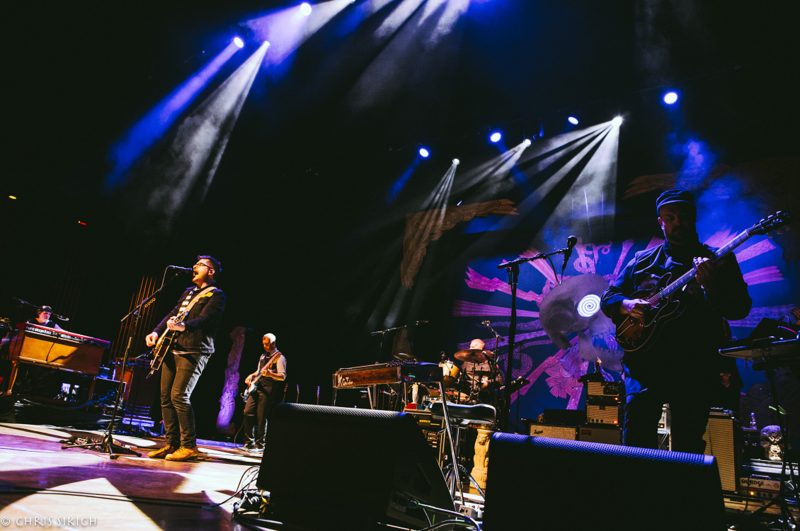 For the 14th time live, my craving for indie rock steeped in rich language, watery peril and whale props was sated when The Decemberists played The Mann Center last Thursday. As part of the Your Girl/Your Ghost tour in support of their eighth LP, the underrated I’ll Be Your Girl, the Portland, Oregon group delivered a rousing spectacle that shows why they are one of the best rock bands around. With band leader Colin Meloy having recent vocal troubles that led to a recent show cancellation, it was great to see him ready to take us on the live journey solo with the brilliant cut from their debut EP 5 Songs, “My Mother Was a Chinese Trapeze Artist.” From there, the whole troupe of The Decemberists took the stage for the new work “Everything is Awful.” With Chris Funk on guitar, Nate Query on bass, Jenny Conlee-Drizos on keys and accordion and John Moen on drums as the core and Kelly Hogan and Nora O’Connor as the additional vocal and musical accompaniment, the band took on the new and the old. In my opinion, I’ll Be Your Girl is a triumphant work that is their best album since 2009’s The Hazards of Love. The catchy choruses and keyboard wizardry make for some of the most poppy songs they have ever made. This is apparent during many instances when the songs are performed live. To get the crowd engaged early on with a sing along for “Everything is Awful,” and to bring an audience member up for “We All Die Young” to play some percussion, and to be serenaded by a saxophone-wielding Chris Funk – all are glorious ways to showcase the new. And the main set closer of “Once in My Life” solidifies the album’s vast wonders. Sounding like an angst-ridden, teenage statement of failures, it plays great after the youthful desires of the band’s nearest approximation of a hit, “O Valencia.” It melds rock old and new. Other highlights included a scorching version “The Bagman’s Gambit,” a song about love and political intrigue, and the joyous delivery of the Lin-Manuel Miranda penned “Ben Franklin’s Song,” which is as perfect an anthem for Philly as one could imagine. There is the climax of the night of “The Mariner’s Revenge Song,” which seemingly never gets old. With the band’s antics and an inflatable whale taken throughout The Mann, it is a final scream of fun-filled life from a band as sharp as ever. Ward opened. Playing the first show as opener, he began with three songs solo, showing off his deft guitar skills. When the band appeared, he decided to announce the surprise drop of his new album What a Wonderful Industry. Playing songs from this and older works, it was a great snippet of his talents. Copyright ©2018 PopEntertainment.com. All rights reserved. Posted: June 11, 2018. Tags: 2018, 5 Songs, Ben Franklin's Song, Chris Funk, Chris Sikich, Chris Sikich Photography, Colin Meloy, Concert Photo Album, Concert Photography, Concert Photos, concert reviews, Everything is Awful, I'll Be Your Girl, Jenny Conlee-Drizos, John Moen, June 6, Kelly Hogan, Lin-Manuel Miranda, M. Ward, My Mother Was a Chinese Trapeze Artist, Nate Query, Nora O'Connor, O Valencia, Once in My Life, Oregon, PA, philadelphia, Portland, The Bagman's Gambit, The Decemberists, The Hazards of Love, The Mann Center, The Mann Center for the Performing Arts, The Mariner's Revenge Song, We All Die Young, What a Wonderful Industry, Your Girl/Your Ghost Tour. Bookmark the permalink.